Becoming a great company takes lots of hard work and ingenuity, while maintaining that standing takes consistency and innovation. Waterfield has been known for consistently producing durable innovative products. The new iPhone 6 Spinn case is no exception. With phones getting bigger and bigger, it becomes a challenge of keeping them with you at all times. This all-leather holster case from Waterfield may help you respond to this challenge by giving you a protected area right on your belt with suede lining and belt snaps to wire management while still offering you choices in leather options. The first thought that runs through your head after removing Waterfield's Spinn case from its bag is “Wow this is big”. However, it needs to be the iPhone6 Plus is a big phone. You can also tell from your very first touch that they are using quality durable leather. Even the suede used for protecting the screen on the inside feels soft but durable. With any leather product stitching becomes a key factor. The Spinn case does not fall short here with solid clean stitching all the way around, including double, triple and more where it is needed. The belt clip at first glance seems like it doesn’t belong mainly because it’s made of a thicker leather, but this is where the case might see the most abuse from everyday use. The snap clip seems to work very well, not too hard to become frustrating not to lose to be constantly popping off. 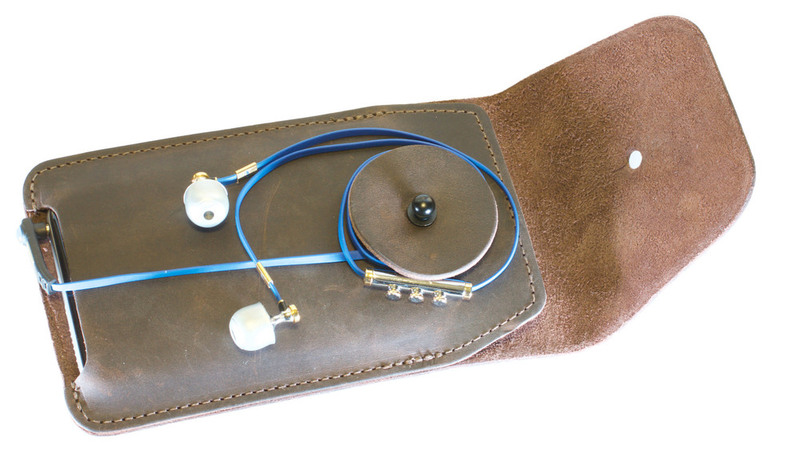 The top flap falls down and locks to Waterfield’s patten pending “wheel” which plans to keep your ear buds from tangling up. Full grain leather in black, chocolate or grizzly. Ultra suede lining on interior screen side. If you're looking for a durable leather case for your iPhone 6 Plus we may have found one for you. After a week of putting Waterfield’s Spinn case through its paces, we found it lived up to our expectations. Bringing the durability of quality leather and classic innovative design. We found the fit and finish to be superb. Our iPhone 6 Plus fits smoothly and sung while still being easy enough to remove. The Swede Inter while only being on one side kept your screen safe from scratches while still giving you a bit of a polish. With that said I would have preferred Suede on both sides. By having this limited to one side means your only option is keeping the screen facing outward. This may just be a personal preference, but when my phone in my pocket, its screen is kept inwards. This way, when pulled out with the back in my palm ready for a call. As it stands, I have to flip the phone around in my hand once it’s removed. This is by no means a deal breaker, but a suggestion to Waterfield to add suede to the other side of the inside. The wire management “wheel” is certainly a nice touch and your milage may vary here. However, we have found that ear-buds with a larger rocker volume control more difficult to wrap up nicely, but when it does it’s a nice option to have. The belt clip has some thickness to it and works as expected. Personally, I wear a 1.25 inch thick belt daily and found the belt clip left just enough room. Making it more comfortable sitting due to its thin design and the ability to tilt forward and backwards. Waterfield has always made good products. The Spinn is no exception. If you're in the market for a durable leather case for your iPhone 6 Plus, I highly suggest you take this case for a Spinn. Right after posting this article, Waterfield informed us they already took the steps necessary to duel line the inside with suede.